About the Author: Sachidanand Jha is pursuing B.Tech in Electronics and Instrumentation engineering from Samrat Ashok Technological Institute, Vidisha. He reminisces about his quest for exploring new opportunities and how finally a graphic design internship opened new doors for him. End of semester examinations, unwilling to go home, and craving for additional experience – there may be a bounty of students facing the similar situation. Hailing from a small town, Nagda, in Madhya Pradesh, the scope of gaining additional experience nearby was limited. Therefore, dropping the option of industrial training during vacations, I opted to explore a new world of opportunities through internships. Let’s face the reality. 18 years of students’ life is judged based on two pages of resume. So, without giving a second thought, I created a profile on Internshala and started looking for internships in multiple fields for grooming myself from every nook and corner (and to add more stuff in those two pages). I moved to my brother’s place in Mumbai, where the number of learning opportunities is more than the places to visit. After applying for a few internships, I found it hard to keep a tab on my applications but kudos to team Internshala for keeping me posted through emails and SMS alerts. After my profile was shortlisted, I was called for an interview with ABECL in Andheri for the first time in my career. Anxiousness had taken control of my nerves. I took my friend’s help for selecting formal dress code and preparing the resume and then started preparing for the interview. That first interview gave me many life lessons; however, I didn’t receive a final call from them. It’s said that one learns from his mistakes and that’s what I did. I started working on my design skills as well as on my portfolio because the presentation of those skills was equally important. Not losing hope, I continued applying for internships. Facing multiple rejections, I was about to give up. That’s when I stumbled upon Internshala’s blog. 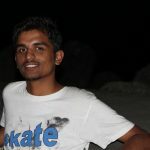 Inspirational stories of students and other skill-based articles motivated me to keep trying. Soon, I was shortlisted by Live Pages Infotech Pvt. Ltd. for a graphic design internship and went for the interview in Goregaon East. Without any expectations, I gave the interview and finally got my first ever offer letter asking me to join from 4th July 2016. On my first day, I reached the office half an hour before out of excitement. I was introduced to all the employees working at the office and made aware of the company’s terms of the internship. I was given the access card and appointment letter. The work culture was simply amazing. Being the only intern at the office then, I was given complete attention and guidance for performing my role. I learned how to effectively use tools like Photoshop and Illustrator. We celebrated every special moment and it was a memorable experience. I made new friends and soon another intern, Shraddha, who also had applied through the same platform, joined in. Providing real services to the virtual world had become our daily task. This internship taught me a lot of things and provided me a peek into my future. I would like to thank Internshala for giving us such an awesome platform that helps in nurturing talent and for the promoting the culture of meaningful and paid internships. Editor’s note: Design your career the way you want. Check out these cool graphic design internships. Internship at NJIT, New Jersey: How I mixed work with fun! Indeed internships are a great way to build your resume.